That’s fine if you’re cultivating a garden in your backyard of perennials and plants that will return each year and fill in over time. But for a container garden with the clock ticking and where you’re looking to get a big bang for your efforts, it was, shall we say, a little sparse. I’ve since learned to put in tight groupings of my selected colors and mix in plants with varying growth habits, so that if you put a tall spiky plant in back, you can stack a compact one in front of it and then a trailing one in front of that for lushness and an added stair-step dimension. 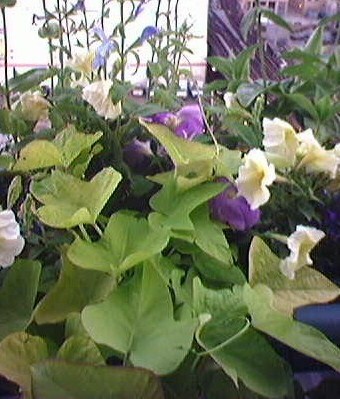 Nasturtium and sweet potato vine (which is in the foreground of the above photo) are hearty and fast-growing trailers for containers. In the past, salvia has been a favorite of mine for height (the blue spikes in the background of the picture). This year I planted bells of Ireland seeds, and if all goes as planned, they will join the salvia plantlets I’ve ordered as the “high boys” holding center stage in my containers. Hi Avis, how are you? Great post! Now I get some tips on how to grow a combo planter. I have limited gardening space too. This information is good for me to maximise use of my garden space. Have fantastic week! This is all so exciting! Though I must admit discouragement by viewing my porch neighbors assorted collection of furniture odds & ends… I will try to remember the idea you gave me about building a small barrier, then a trellis with flowers that will climb to obscure my view – of them… Can you do a post about climbing vines as well as the trailing ones? Or are they the same plants and depends on how you “lead” the vines? The climber I use is morning glory. It grows quickly. Also, moonflower, which is much like MG, except it blooms at night and the blossoms are HUGE and have a light, wonderful fragrance. I’ll probably write more about them later. I mix MG and MF so them intertwine. I love moonflower as well – I grew it up an obelisk in a pot last year. The trick to success with it in the UK is to start the seeds off really early under cover.